So here it is (drumroll please), my first guest blogger! How exciting. 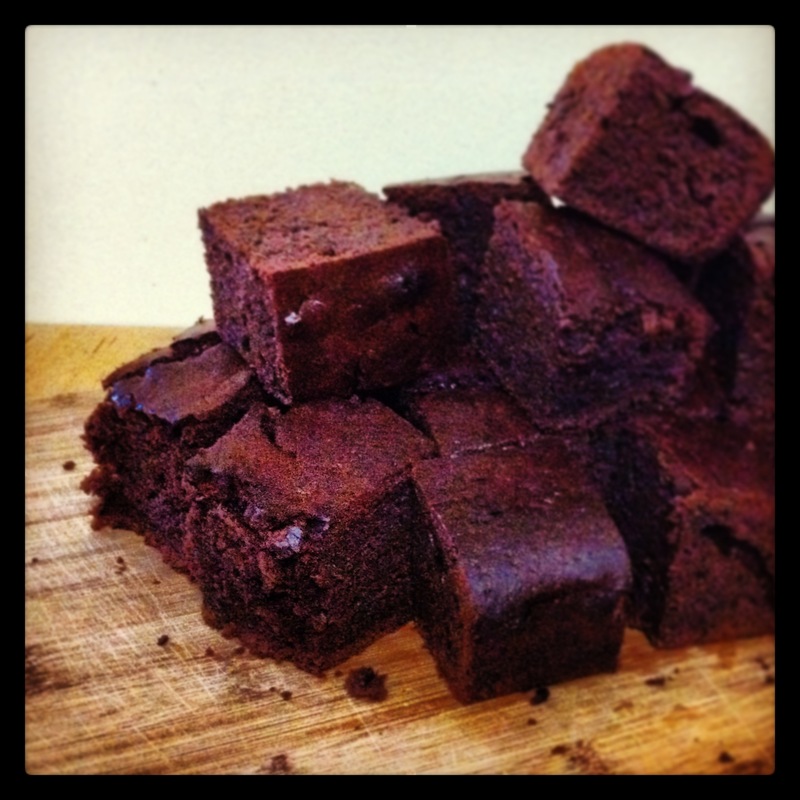 My good friend Em makes these gorgeous black bean brownies which are a healthy treat that the whole family can enjoy. They are an absolute hit with the kids and are packed with nutrients. Great for an after school snack or in their lunchbox, and yum for everyone else too! Black beans are considered a ‘superfood’ because they are packed with a rare combination of protein and fibre which is great for the digestive system, the cardiovascular system, and for regulating blood sugar. This protein-fibre combination is not found in fruit, vegetables, meat, dairy, nuts, seeds or seafood. Only in legumes, including black beans. Em says “These are fantastic, always moist and chocolatey, and without a hint of the goodness of the beans hidden within. They can be made dairy free using milk free chocolate. I have not tried to make gluten free but I believe the plain flour can be replaced with a GF option”. Cook black beans on the stovetop using My New Roots method by placing 1 cup of beans and 3 cups water in a large pot, bring to the boil then reduce to a simmer, cooking beans until tender (approx 45-60min). Cook black beans in the TMX using Tenina’s method by placing them in the simmering basket in the TMX, then filling the bowl with enough water to just cover the beans. Cook 30 min, 100C, Sp 3. Cook black beans in the pressure cooker using Em’s method by placing 1 cup of beans and 3 cups of water in the pressure cooker and cooking for 20 minutes. Bake at 180C for 20-30 minutes – Em says “My oven is a big old gas oven without a fan and therefore everything takes a while. The brownie should be matte at the sides and shiny in the centre, it should still be slightly soft in the centre”. This risotto recipe is a family favourite at our place. I like to roast the capsicum and pumpkin separately in the oven which gives a really great flavour to the dish. This risotto is equally as delicious as a vegetarian meal – simply omit the chicken and add an extra 100g of water. By now you know I have a love for good curry recipes. 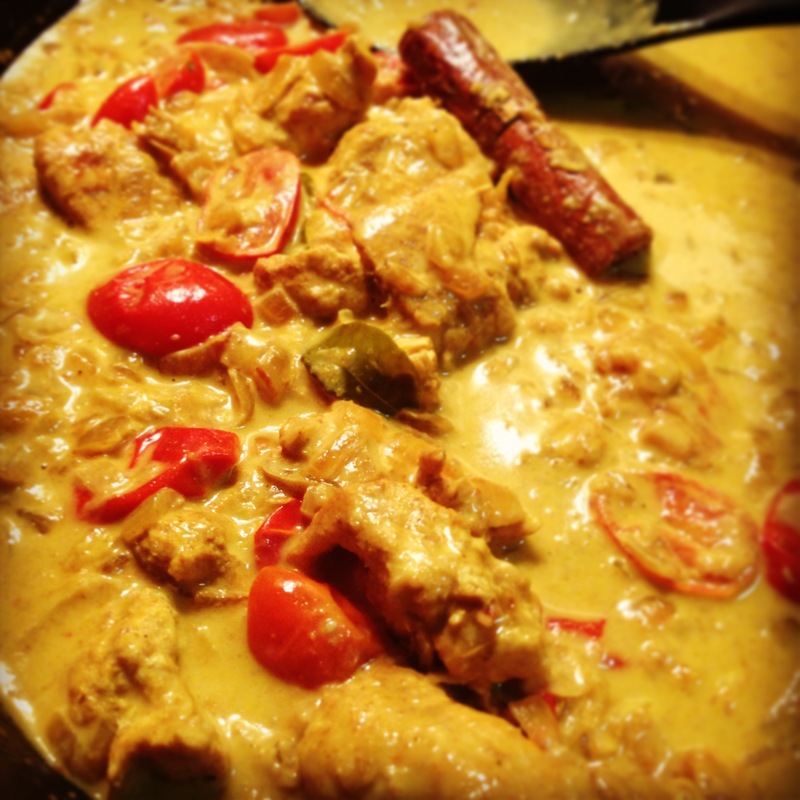 This Madras Curry is another family favourite. The original recipe is an ‘Indian Inspired’ one Curtis Stone wrote for Coles during the Commonwealth Games. I have tried cooking this in the thermomix but I just can’t get the same flavour as I get cooking it in the frypan. I usually cook my rice and steam veggies over the top in the thermomix and varoma while I cook the curry on the stove. This recipe is done with chicken, however it can easily make a delicious vegetarian meal either by adding chopped vegetables to the pan instead of the chicken (eg. pumpkin and cauliflower) or simply cook the sauce in the pan and pour over steamed veggies and rice. * I have a curry leaf tree in my garden which my father-in-law gave me. If you don’t have a tree, try and get frozen leaves from an asian grocery store. If you know someone with a curry leaf tree, pick the leaves and store them in a zip lock bag in the freezer then just throw them straight into your curry from the freezer. They add an amazing flavour. Get your rice and veggies sorted in the TMX & Varoma or Rice Cooker & Steamer. If your ingredients are prepped the curry needs approx 30 min cooking time, so you can time your rice and veggies accordingly. Heat 2 tbs rice bran oil in the pan over medium high heat. Add onion and cinnamon stick, and cook stirring frequently for 3-5 minutes until golden brown. Add the ginger and garlic, and cook for another minute. Turn the heat down to medium low. Add all the spices and curry leaves with an extra 1 tbs rice bran oil if necessary. Cook for 3 minutes, stirring frequently so the spices don’t burn. Add the chicken to the pan and cook a further 3 minutes, stirring so that the chicken is coated in the spice mix. Add the tomatoes and stock. Stir through then cover pan with lid and simmer on low for 15 minutes until chicken is tender and tomatoes have broken down to form the sauce. Add the coconut milk and stir to combine. Simmer for 2-3 minutes until warmed through and sauce thickens. Serve with rice and veg, and enjoy. This Moussaka recipe is the product of much experimenting on my part. I wanted to make a really delicious Moussaka that wasn’t too labour intensive, so I’ve eliminated all the fussing and just kept all the flavour. It is a great family meal, packed with veggies and easy to adjust either for meat lovers or for vegetarians. My kids absolutely love this dish. Many recipes call for the eggplant slices to be salted, left to drain for 20min, rinsed then dried. I never bother to do this and it still tastes great.